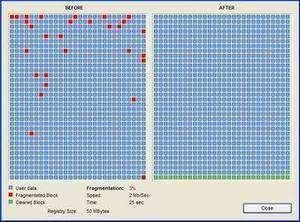 Registry Defragmentation is a small utility that does gigantic improvements in PC performance. Registry is the core of any operating system and it is the proper functioning registry that determines how fast the computer boots up, launches applications and carries out commands. This application physically defragments the Windows registry file to give it the proper linear structure. For security reasons, you should also check out the Registry Defragmentation download at LO4D.com which includes virus and malware tests. Additional screenshots of this application download may be available, too.